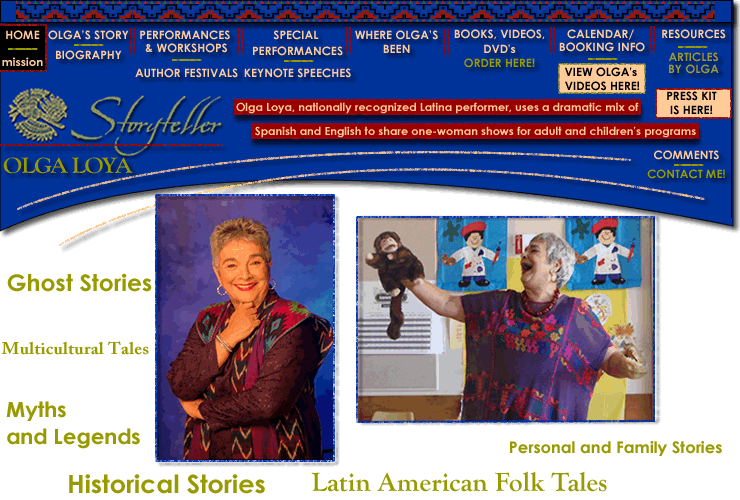 Storyteller Olga Loya was captivated by the vivid stories her Mexican grandmother and father would tell. Absorbing all of their secrets and following the tendrils of memory that bind people and families, Olga fashioned and invented for herself, out of her own substance and imagination, a stirring universe of creation. Growing up in the barrio of East LA, where family rituals and traditions were the center of her emotional life, the young Latina, performing improvisation as a girl, has mastered the expressive vocabulary of artful storytelling. With her poetic eloquence Olga's stories are an impassioned quest to keep alive not only the fabric of her family but the larger Latino culture, richly robed in folktales, ancient myths, and history. There are personal tales, short stories inspired from a mix of newspaper and dream, healing stories, tales of extraordinary women, of myriad voices and inflections, and sometimes music and dance. Olga Loya's journey revealed to her the capacity to make one's life a surprise, even to herself, and especially to her audiences. And the magic is how she draws her listeners into unexpected realms. I envision a world of passionate kindness, supported by my mission of using stories to help people overcome emotional and cultural borders. It is my fervent belief that stories reveal the commonality and individuality in our lives, that diversity offers opportunities to embrace the richness of cultures, that there is wisdom to be found in stories shared with fierce honesty, and, most telling of all, that laughter softens hearts. Web site developed by eBluegoose.com.